About three years ago I wrote about how much I loved whole wheat pastry flour (WWPF) and it was my BFF for life. I am here today to say that I have a new love. It is white whole wheat flour! I’ve always been a little skeptical of white whole wheat flour. I never thought it was as good as regular whole wheat flour and was some kind of marketing gimmick. Turns out white whole wheat flour is just made from a different variety of wheat that gives it a lighter color and milder flavor. I purchased some white whole wheat flour last week and have been on a baking spree ever since. The best thing about the white whole wheat flour is that it is almost unnoticeable in baked goods. Benzo and I kept exclaiming over and over “this doesn’t taste wheat-y at all!” I used to go half and half with the WWPF in baked goods but with the white whole wheat flour I can switch out the entire amount and almost not notice it at all. First is banana pancakes, courtesy of 100 Days of Real Food, sprinkled with a bit of homemade granola. The white whole wheat flour is completely unnoticeable in this recipe. This version is a little bit healthier than a previous version I made. If you like bananas and pancakes you should definitely try it. Next is super easy whole wheat biscuits, also courtesy of 100 Days of Real Food. 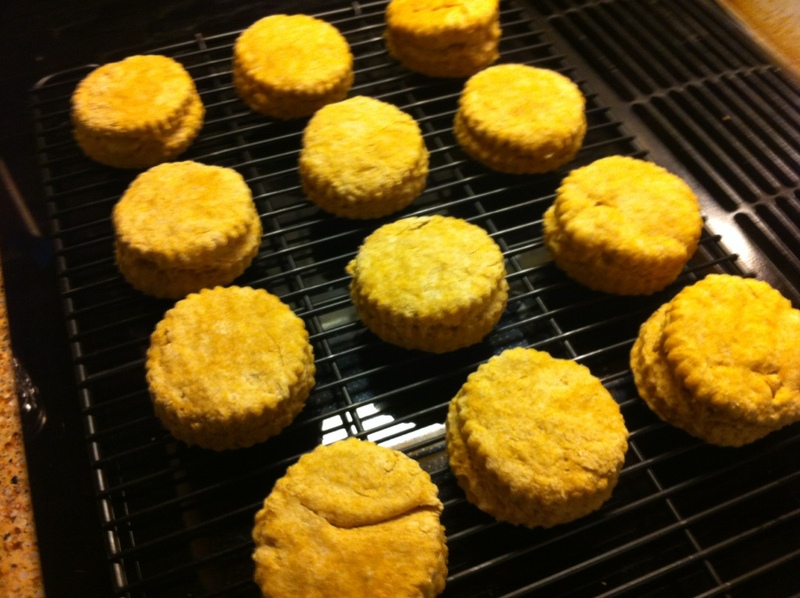 The wheat flour was a little bit more detectable in this recipe but the biscuits are so good you will hardly care. I’ve made two batches of these in the past 10 days. I can crank out a batch from start to finish including clean-up in about 30 minutes. Not too bad! I also used the white whole wheat flour to make homemade Ritz crackers. You can also taste the wheaty-ness in those crackers compared to crackers made with white flour. But I don’t mind the taste myself and neither did anyone else in my family. I’ve made two batches of pumpkin muffins, recipe again from 100 Days of Real Food. Can you tell I love that website? 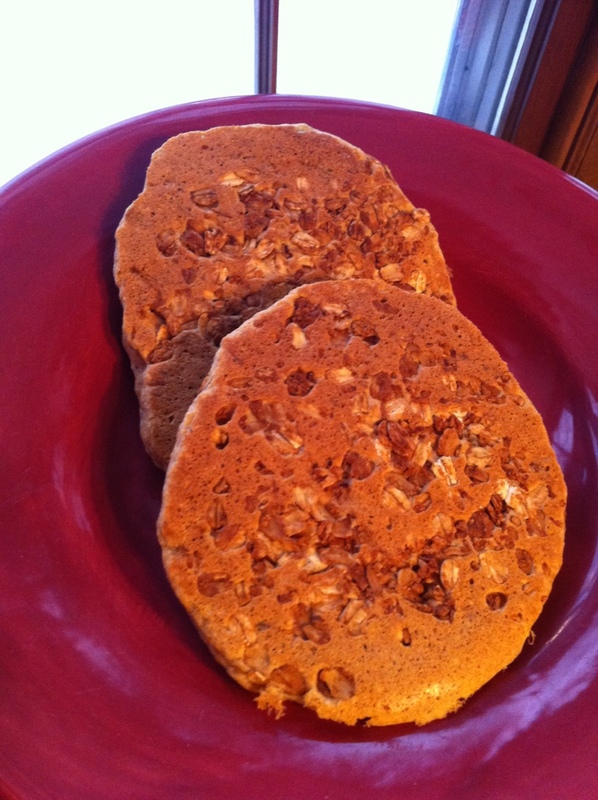 I love this recipe because it is whole grain and free of refined sugar. But the best part is that these muffins taste exactly the same as a sugar-laden version I’ve made before. They are amazing. I’ve also made two batches in the last 10 days. They make great snacks. Finally I’ve made homemade cheesy crackers, like Goldfish but in different shapes. I’ve also made homemade donuts entirely with this flour. Both turned out great but I plan to write more on them later in separate posts. Hi. Do you have experience using white whole wheat flour as a substitute to white flour in cupcakes? I read that if you just use whole wheat flour to substitute white flour you should either mix it with the white flour(which I don’t think you use at all-correct?) or if you use it to completely substitute you have to adjust the liquid ingredients. Any input from your experience would be appreciated!! Next onto a healthier vegetable oil substitute for the cupcakes! Thanks! Hi Jennifer. I am pretty new to using white whole wheat flour and haven’t tried it for cupcakes yet. I definitely plan to though! I believe you are correct on adjusting the liquid. I think when subbing whole wheat flours for white you need to increase the liquid ingredients because whole wheat flours tend to absorb more moisture. I’ll let you know if I find a good recipe! I just started using white whole wheat flour myself, and I fiind my recipes don’t rise well. Any suggestions? Hi Mimi. Are you using recipes that are written for white whole wheat flour or are you swapping it out for all purpose flour? A quick bit of googling let me to several sites that said whole wheat flours simply do not rise as much as white flours.